Meet Bob. 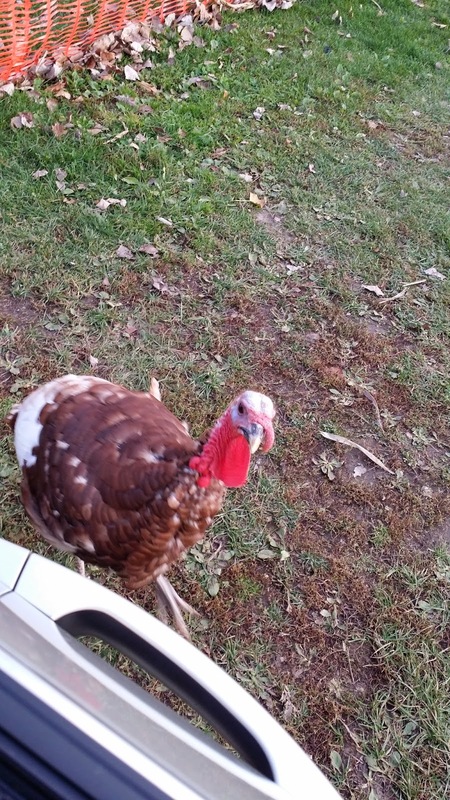 Bob is a Bourbon Red turkey which was donated to us one week before we opened for the 2014 season. A very nice lady called and asked if we would like a turkey. Not being a stranger to having animals donated to us, I said sure. When I met with the couple that donated Bob they explained that they ordered 40 different eggs from Ebay, and incubated them to hatch themselves. To their surprise Bob was the ONLY egg that hatched. Apparently the eggs weren't fertilized. I always tell people who want to buy eggs, be sure to use a repuatable source like McMurray Hatchery that way you know you are getting quality product. 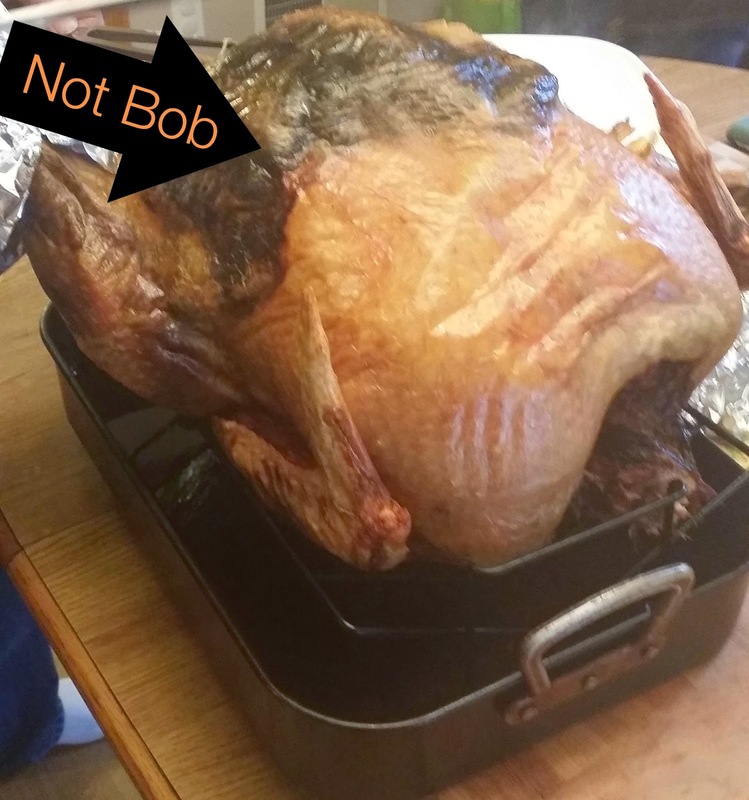 Bob was quite pampered at his home being the only turkey. I do beleive they said they kept Bob in the house. However, they lived in the city and were not able to keep Bob. 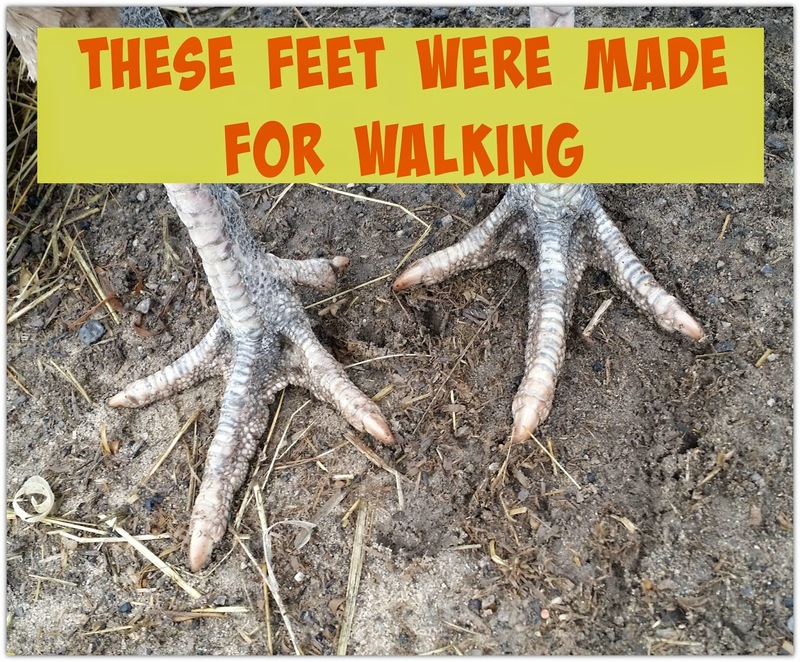 They had intended to raise the turkeys and release them on some property they had north of town, but with Bob being the only bird.......they were worried he wouldn't survive and kept him at home. So in an effort to find a place for Bob, they called and asked Grandma's Pumpkin Patch if we would take him. When Bob came to us he was about six months old and probably weighed 15 pounds, he was a scrawny bird compared to our full grown turkeys. When I put him in the turkey pen our turkeys started walking over to him all puffed up with their feathers out. Apparently this sared Bob because he turned and slipped between the wires of the pen and got out. So I put him in the pen with Mrs. Peacock and her roomate Mr. Chicken. Well they were not too keen on this new bird in their pen. When animals are in groups or with poultry, flocks, they have to establish a dominance hierarchy. Mrs. Peacock and her roomate started pecking at Bob to let him know that they were the boss. We left Bob and his roomates to work things out. Later in the afternoon when I checked on Bob, I could not find him. I did not see him anywhere in the pen, and looked in the coop and did not see him either. I thought maybe he escaped, and started yelling his name, which seems ridiculous because how could a turkey know it's name?! To my surprise, Bob replied with a small little cluck that sounded sad and scared. I looked again in the coop and found Bob hiding behind some old plywood we had leaned up against the wall for storage. I moved the plywood and Bob came running out to us, he was obviously very accostome to people. I looked Bob over and saw that Mrs. Peacock and her roomate apparently ganged up on him and broke his wing. Bob needed a new home. He was too small for the turkey pen, not wanted in the peacock pen, he had no where to go. That is how Bob became a free range turkey. 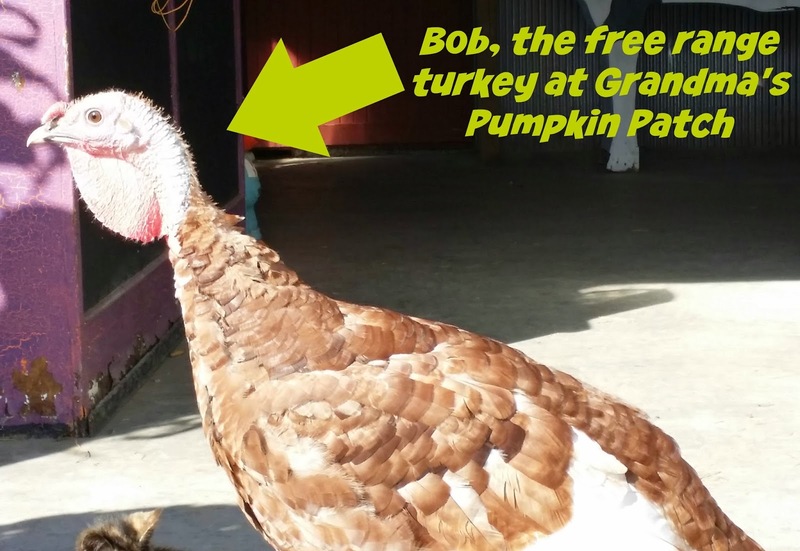 If you came to the pumpkin patch during the 2014 fall season you probably saw Bob running around during the week. On weekends we had to lock Bob up in the barn because people were rather currious and got a bit agressive with Bob. Children were chasing him, adults tried to catch him, poor Bob was getting picked on. Now that the season is over Bob has full range of the pumpking patch. 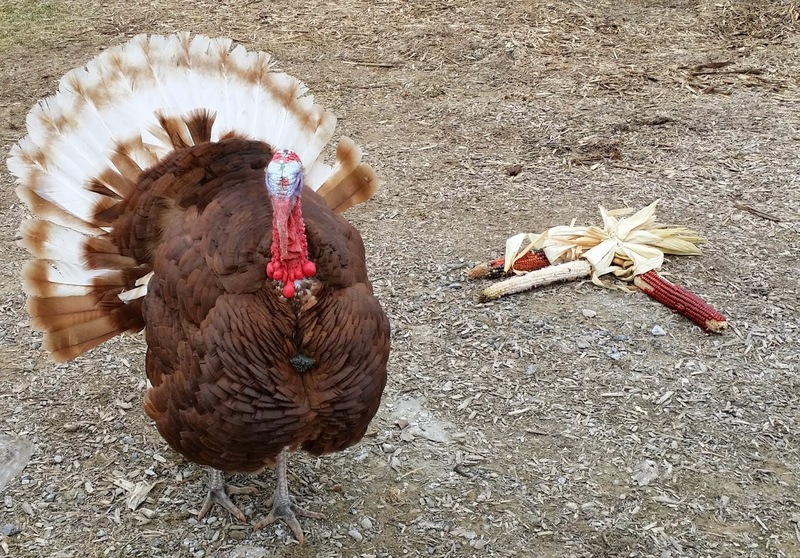 He was given a "Presidential Pardon" by my dad and escaped being Thanksgiving dinner. Every morning Bob meets my dad at his workshop and walks around the patch with him doing chores. Bob also greets Aunt Sue when she comes over to feed the goats and lets her pet his face. Bob loves to have his eyes rubbed. Bob keeps a close watch on the patch, if a car happens to pull into the patch, he will immediatley chase after it and even down the road. Apparently Bob thinks he is a watch turkey. Well Bob is getting quite brave in his free range travels and even made it 1/4 mile up the road to the local bus stop. It was a quiet, sunny December afternoon and I was working in the store down the road from the pumpkin patch. All of a sudden I hear a lot of laughing and screaming from the other side of the store. One of the clearks comes over to my desk and said "Bob is out at the bus stop chasing children." I jumped up and looked out the window, and the school bus is still at the stop. The kids are getting off the bus, and Bob is fully puffed up chasing the kids. It was the high school bus, so these children are teen-agers running from a turkey. Needless to say, it was hillarious, but also scary at the same time. As the bus pulled away, cars started to fly by, narrowly missing Bob. I took off on a dead run out the door, and of all the days I wore dress shoes insead of my sneakers. Trying to run with a smooth bottom shoe is difficult. I yelled Bob's name as loud as I could and he turned to look at me, recognized who it was and immediatly smoothed his feathers and ran to me. I think in his travels he got lost and stumbled upon the children and wasn't sure what to do so...... he stared attacking them. When he saw me, he was relieved and ran right to me. The only problem was, Bob was in the middle of a VERY busy road. I had to wave my arms and flag down some cars to stop so I could pick Bob up. I can only imagine what the drivers of the cars were thinking seeing a grown woman run to pick up a turkey. I picked Bob up, which is difficult because he now weighs around 30 pounds, and is squirmy. I had to cary a 30 pound turkey a 1/4 of a mile back to the pumpkin patch and find someplace to keep him so he would wander again. The children were astonished I could pick the turkey up, and kept asking me questions. "Is that your turkey?!" "I've never sceen a turkey that BIG before" "Where does he live?" After answering their questions and explaining that Bob lives at the pumpkin patch, I carried Bob home. The whole time Bob was clucking to me, I think he was trying to tell me his side of the story. I was just thankful Bob didn't try to peck my face, because afterall eventhough he is a pet, he still is a turkey. I loocked Bob in the barn to keep him from wandering back and told my dad about his adventures that day. I figued my dad could deal with Bob. It was a cold walk back because I ran to get Bob out of the road in such a hurry, I forgot my jacket. The walk to the barn I had a turkey to block the cold December wind, but the walk back, I was freezing. I quickly hurried to the store and called my dad to tell him about his adventourous bird. We let Bob out of the barn after dark so he wouldn't be enticed to wander, he would settle in for the night. Bob cannot stay in the barn long term, he poops everywhere and eats the grain. He is a pesky bird! Now the neighbors love Bob and think he is hillarious. The one neighber, whose child was chased by Bob, even feeds him in their back yard. Bob is definatley a free range bird, if you are ever on Eastman Rd by the pumpkin patch, slow down because Bob is probably out and about.